Pictures taken on a quick look-see. 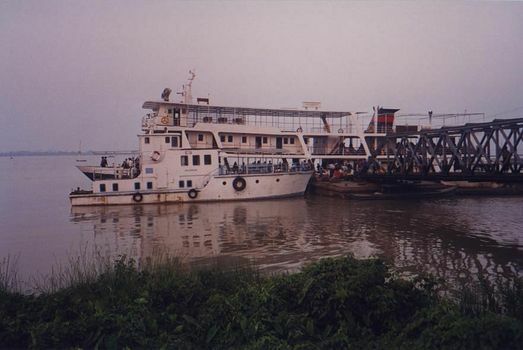 The passenger-ferry offloads on Lower Main Road, one of two main streets (Lower and Upper Main) that parallel the shore. 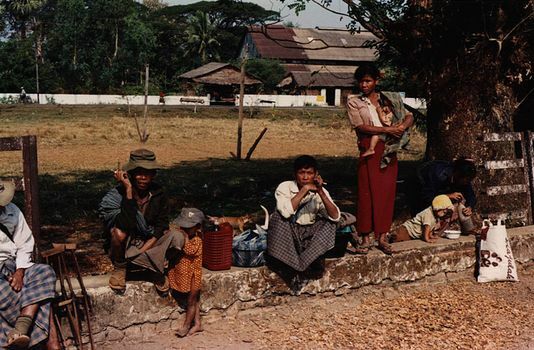 The Salween is in the background. The ferries are all steerage-class, but there's plenty of dignity among the passengers. In addition to the passenger-ferry dock and another dock for heavy trucks, there are informal landing places where boats float in on the tide and unload while the tide's out. 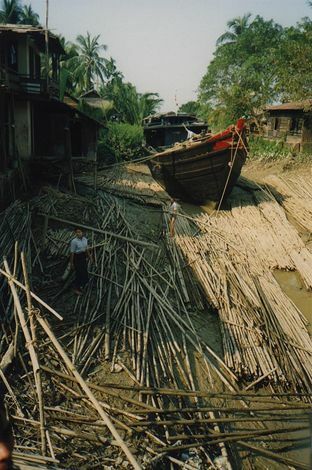 Here, a load of bamboo is being hauled from the ship, stick by stick. The heart of the town lies between the waterfront and a ridge that is set back perhaps a kilometer from it. 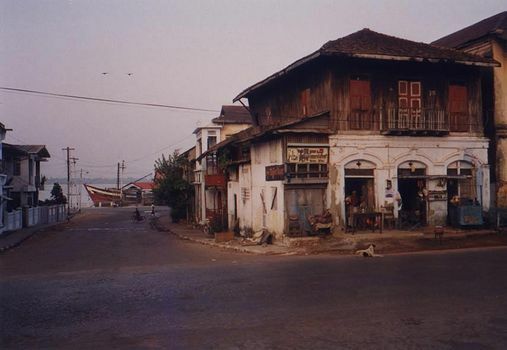 In that space, the streets are roughly gridded, as this picture, taken from Lower Main Road, suggests. 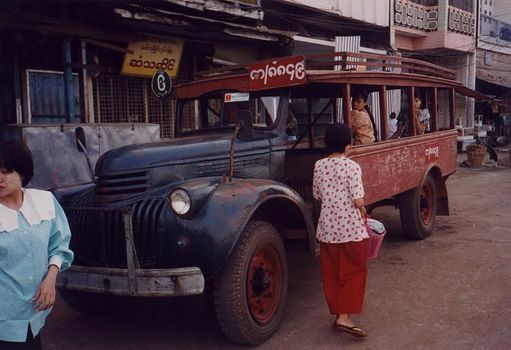 On-land transport is dominated by World War II-vintage trucks, a running museum of Fords, Chevies, and Dodges. 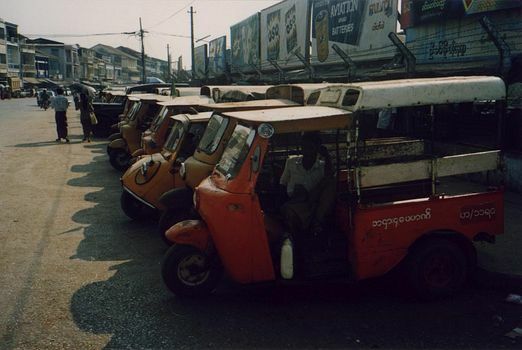 Auto rickshaws are themselves of vintage age. 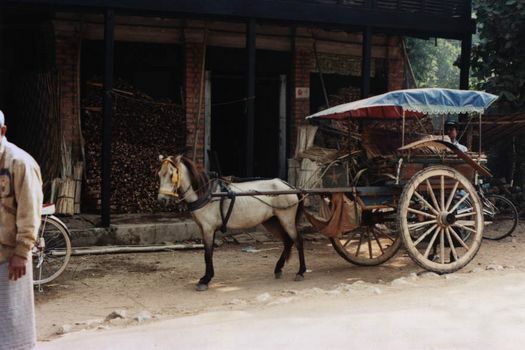 Mechanical systems of every sort are in very poor shape. 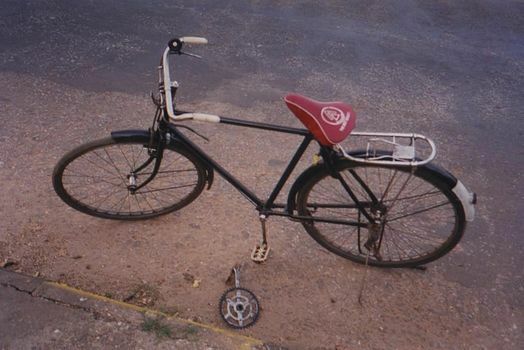 Here, a rented bicycle simply falls apart. 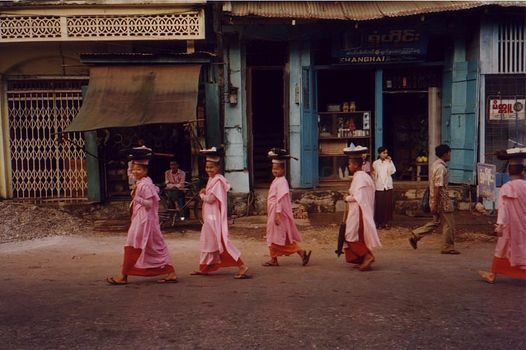 Buddhist nuns grace an otherwise grim street scene. 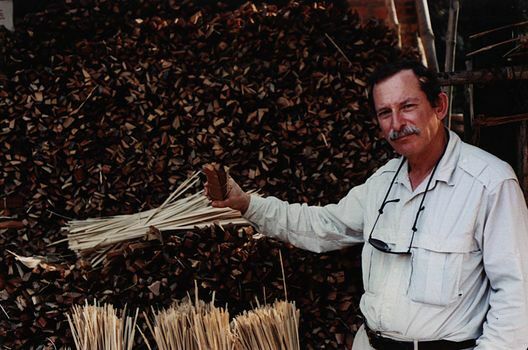 Firewood for sale. The hand-size bundle is just enough to cook one meal. 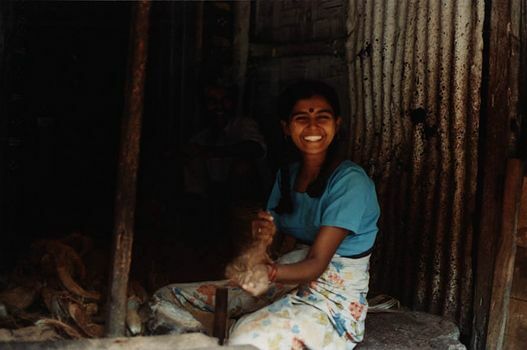 One source of local income: an Indian girl using a hammer to break coconuts--hundreds of coconuts, mountains of coconuts. 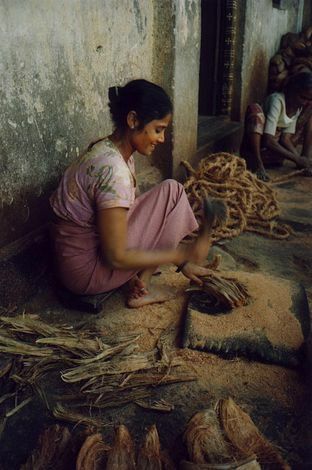 It's an assembly line, with the extracted coconut-fiber woven into coarse rope. 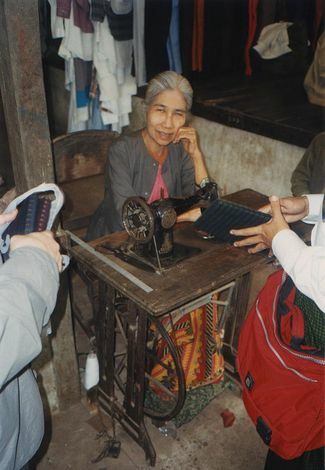 A seamstress in the central market. Blind in one eye, she did good work with the other. Happy to add a button. 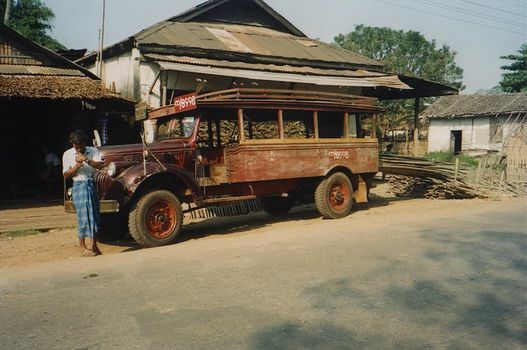 There was a time when Moulmein was famous for its teak mills and its log-handling elephants. 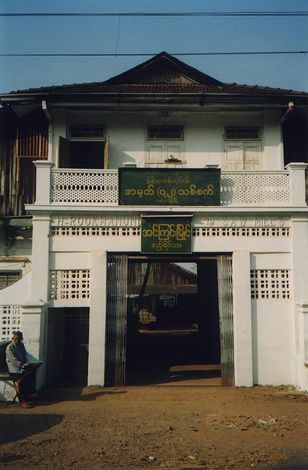 (This was near the place where Orwell shot that elephant of which he wrote in "Shooting an Elephant.") 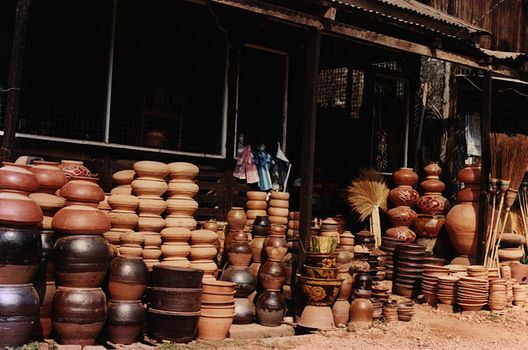 The elephants are gone, and the teak mills are mostly abandoned. Here, the entrance to one formerly Indian-owned mill. 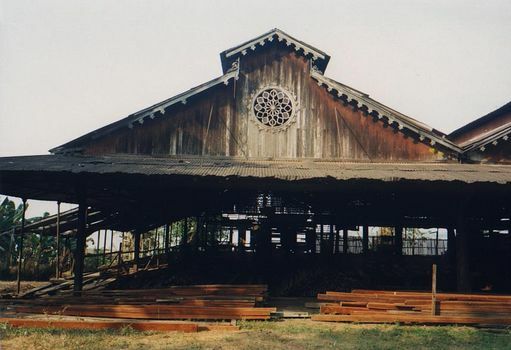 The sawmill proper, with the waterfront beyond, from which logs were dragged. The beautiful lumber suggests that this mill operated in the recent. Note the rose-window and clerestory lighting, surprising touches. 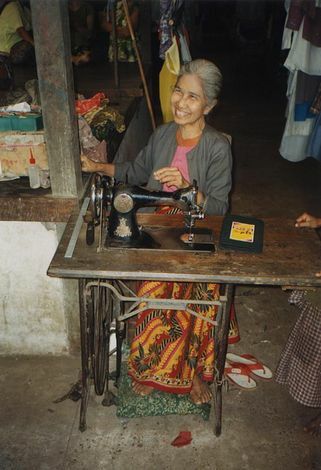 The mill had its own boiler to drive the machinery. 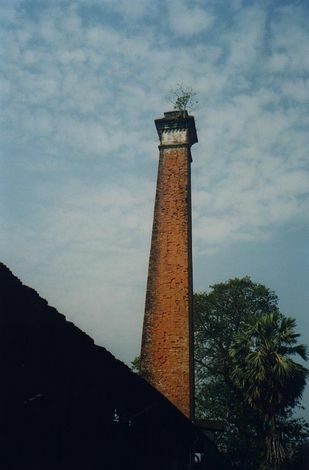 The chimney isn't long for this world, however, if trees are allowed to grow in it. 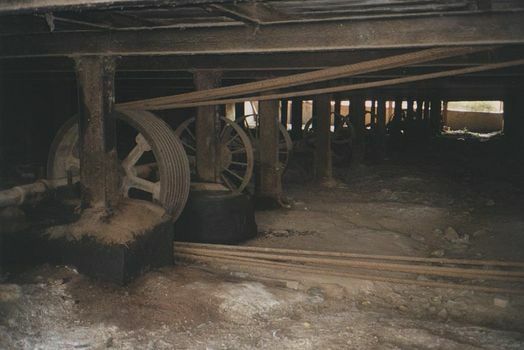 Down below, elaborate belting connected the steam engine to the mill's circular saws.